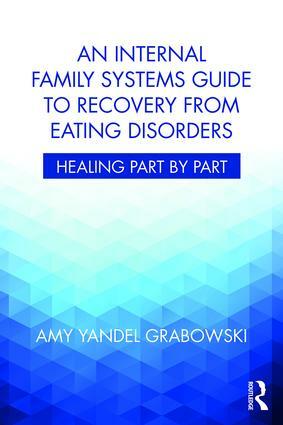 ​Healing Part by Part: An Internal Family Systems Guide to Recovery from Eating Disorders - Written in an informal conversational style, this book combines compassionate examples from the author’s client cases and her own recovery with a step-by-step framework for identifying and healing the readers’ Parts (their “Internal Family”). Readers gain knowledge of how to heal their three groups of inner "Parts": the Mentors, the Advocates, and the Kids. In order to reconnect to their sense of Self and to achieve an inner balance necessary for recovery, the reader learns to address the unique needs of each of their "Parts." Each chapter ends with questions for the reader to answer to further enhance their personal recovery. This book is also essential to mental health professionals who would like to learn the Internal Family Systems model to treat clients with eating disorders and to the clients themselves. Click HERE to listen to a podcast of Amy discussing recovery from Eating Disorders using the IFS therapy model. a past member of the Academy of Eating Disorders. ​Click HERE for information on purchasing the CD or an MP3 file.